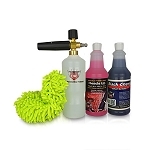 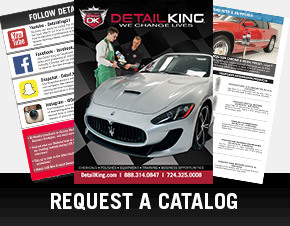 The Detail King Foam Cannon for pressure washer use is the perfect choice for the professional car detailer or car enthusiast seeking to wash any vehicle using this amazing tool that produces unbelievable amounts of foam. Give your vehicle a “Touch less Wash” while removing dirt and road grime faster than ever before. 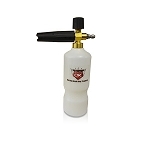 The Foam Cannon sprays a very thick foam and completely covers the vehicle for the safest car washing experience. 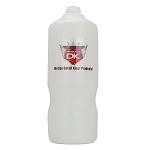 The DK Foam Cannon allows you to wash the vehicle without even having to touch the vehicle, reducing the chances of creating holograms and scratches which are caused by rubbing dirt into the painted surfaces. 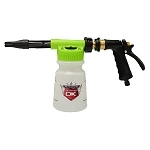 Utilizing the newest most innovative technology of the air injection process, the Detail King Foam Cannon creates thick snowy foam that assists with the removal of grim from the smallest cracks and crevices. 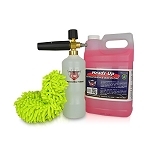 This is a OEM product that would be an extra 32 oz. 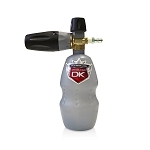 bottle for your Foam Cannon. 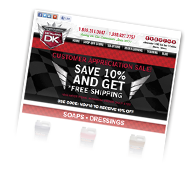 You may want to keep a spare bottle in your auto detailing arsenal.